Australia includes an area of 7 million km2 and a population size of 22 million, making it one of the most urbanized countries in the world. It is a culturally diverse nation with people from over 200 countries living mainly in coastal regions. The official language is English. Despite the geographical conditions, Australia is economically successful, and the citizens have a relatively high standard of living. Australia offers international investors a low-cost, innovative environment and an attractive, low-risk target for their business activities. Australia has free trade agreements with many of its regional partners as well as conventions with countries in the ASEAN (Association of Southeast Asian Nations) group, Chile, New Zealand, Singapore, Thailand and the USA. These bilateral trade agreements provide competitive advantages for international investors in the operation of these markets. Australia was in particular highlighted repeatedly over the last 10 years as a hot spot in terms of biotechnological research. From 190 Australian biotechnology companies in 2001, approximately 60% were attributable to the field of red biotechnology (medical focus), 20% belonged to the agricultural and food-oriented green biotechnology, while about 4% concerned the gray biotechnology sector with an environmental focus. The Australian companies opened up more and more to the international capital markets. In 2001, 15 companies were listed on the Australian Stock Exchange and beyond in the USA and Europe. The Australian Government supports the development strongly and provided 736 million $ specifically for research in biotechnology in 2002. With the passage of the Research and Development (R&D) Tax Incentive legislation in 2011, the Australian industry has received a major boost. Today there are more than 400 biotechnology and 600 medtech companies. The industry is characterized by many small to medium private and public companies. The major area of business is therapeutics (48%) with medical devices and diagnostics representing 38%, respectively. The new Tax system makes Australia very attractive for foreign investors, as companies with R&D activities can claimed tax credits. The business sales of the Australian pharmaceutical industry was 9.9 billion $ in 2013 according to IBISWorld. The major proportion of 73% was attributable to prescription drugs. A key element of the Australian distribution network of drugs is the Pharmaceutical Benefits Scheme (PBS). About this subsidy mechanism, the Australian government wants to keep drugs affordable for the population. The pharmaceutical industry invests about 1 billion $ in research and development. 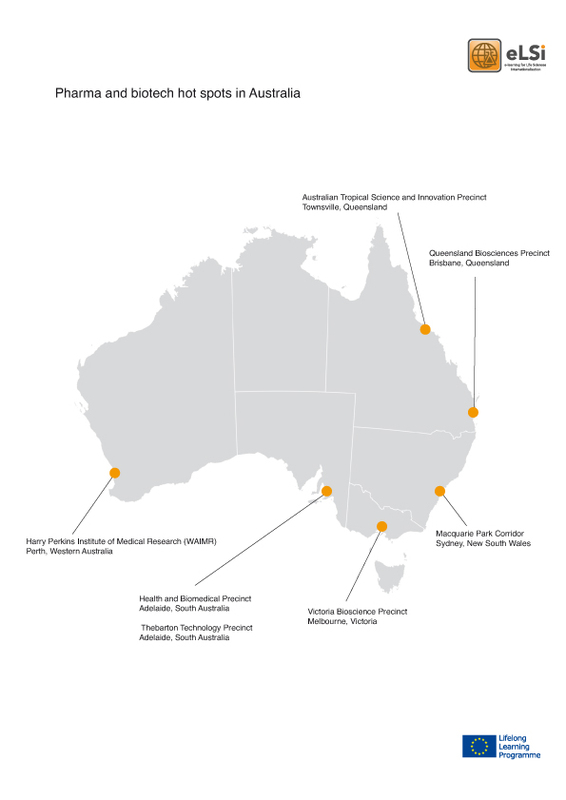 The life science companies are mostly located in several hot spots, like Sydney, Melbourne, Perth, Brisbane and Adelaide. If you want to start business in Australia, note that each contributes to decision-making process, even if the boss ultimately makes the final decision. It is expected that everyone says, what he thinks. Australia is a small market, but with a highly educated population, recognizing the importance of the international markets. Detailed information about life science business in Australia can be found in the eLSi training materials.